← The 5th OYO Circus Workout! Click on the photo of the workout to download the workout itself, the exercise reference guide, and workout tracking sheet! Click HERE for the last 5 OYO workouts! 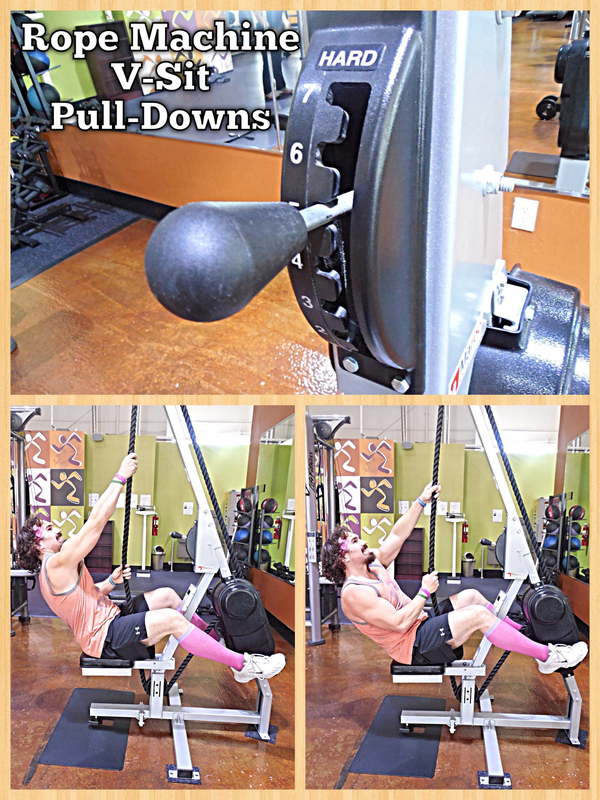 Lateral Jumps on Pull-Down Machine – 2 things you need to do immediately before getting started: make sure the short handles are attached to the pull down machines AND that you have ALL of the weight selected (don’t worry, you’re not lifting it J). Once that’s done place one foot on the seat with the other to the side. Using the handles to pull yourself you want to simultaneously jump up to the other side while transferring feet. Use the handles to control your body on the way down as well as getting a really good stretch so you have more spring! Get as much jump as your body will allow and go as fast as your body is able! 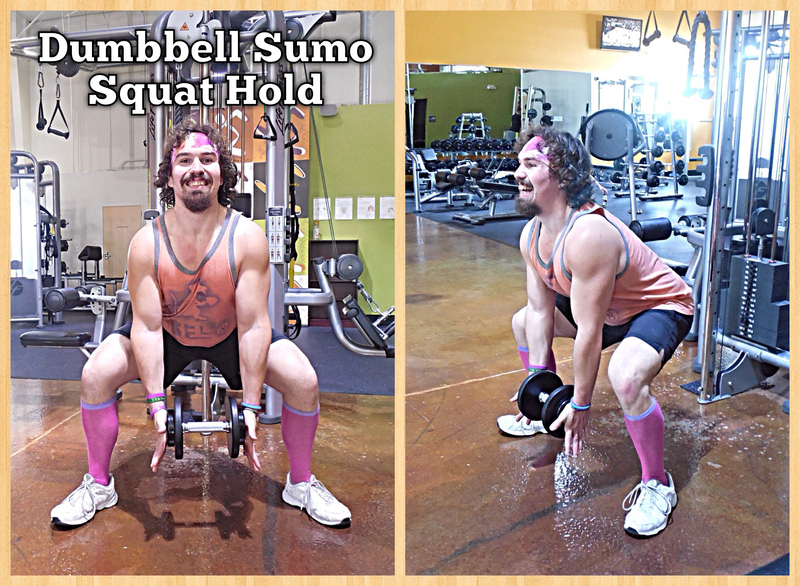 Dumbbell Sumo Squat Hold – Imagine a wall-sit but a tad bit more difficult. Choose a dumbbell weight that works for you knowing that grip strength will play a role! Once you have your weighted dumbbell of choice take a wide stance with your feet, squat down with the dumbbell while holding on to the sides of it, and hold that squat! When gripping the dumbbell make sure you have your fingers all the way spread out (as pictured) so as to utilize the entirety of your body when holding it. You also want to make sure you keep your head up and chest proud the entire time so your body is in proper position. Go down only as far as able while still maintaining proper form. 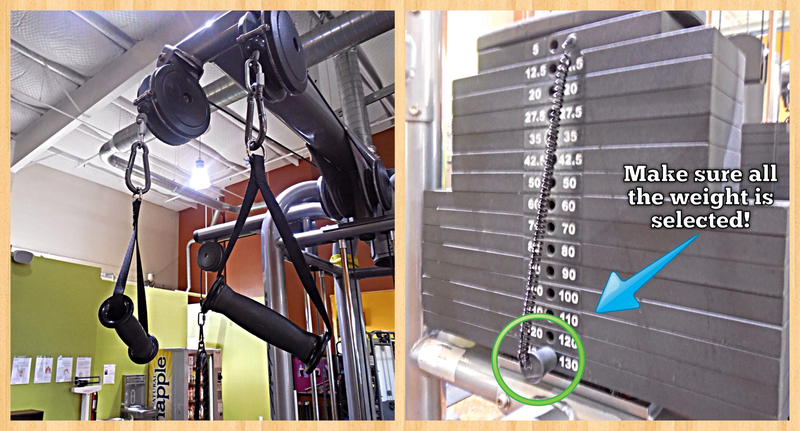 Rope Machine V-Sit Pull-Downs – Make your way to our “MARPO” Rope machine and set the difficulty anywhere between 5-7. Once down take a seat on the bench and get in a v-sit position (feet off the ground, abs tight, balancing on the bench). For a lot of you your back will start screaming at you so if that is you do this exercise with your feet on the ground. Once in position you are reaching up as high as you can and pulling down as fast and hard as you can alternating each arm as quickly as possible. There is a timer on the machine itself so keeping time count is easy on this one! 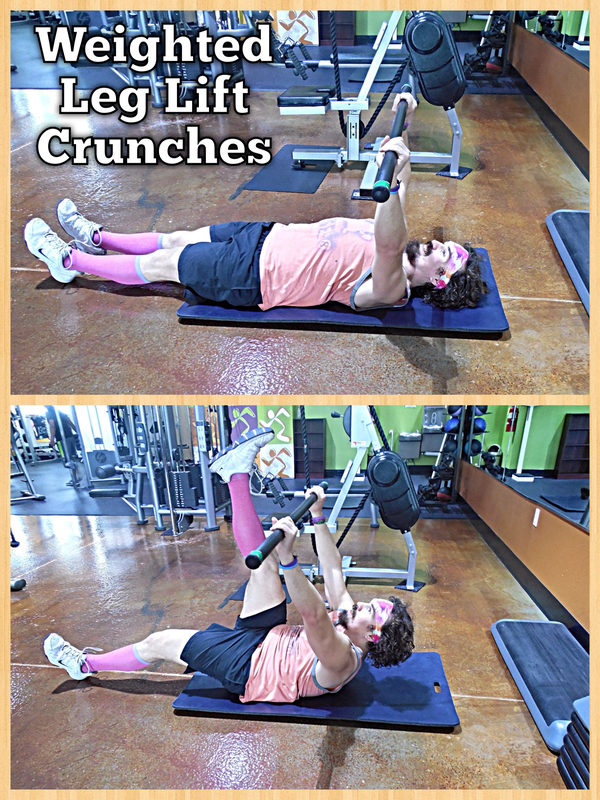 Weighted Leg Lift Crunches – Lay down on a mat with a barbell weight of your choice. 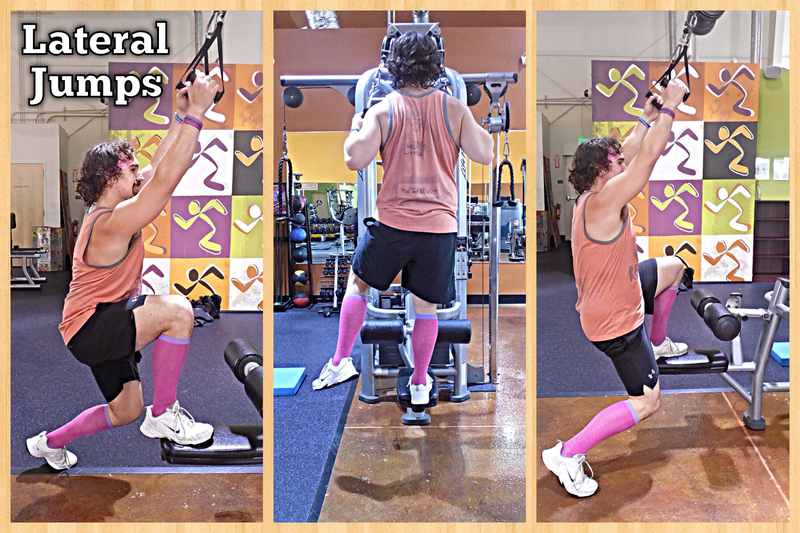 Keep the bar extended over your chest with both legs all the way extended. One at a time you’re going to alternate lifting your fully extended leg as high up as you can while trying to touch the bar to your foot in a crunch movement. Cable Pull-Overs – Take a rope attachment and place it on a cable apparatus of your choice while making sure that cable is as high as it can go. Once in position choose the weight appropriate for you, grab the handles, and take 2 steps back so that you can stretch forward at the waist while still keeping tension on the cable. Once all the way stretched out while leaning forward at the waist (trying to get your back closer to parallel with the floor) you’re going to keep your arms fully extended (don’t lock your elbows!) while pulling the ropes to your pockets (or where pockets would be). If you have to round out your back (meaning your chest isn’t out and proud at the end of the movement) then you have too much weight selected. Go back to the starting position while consciously stretching your back out in the process. Repeat! 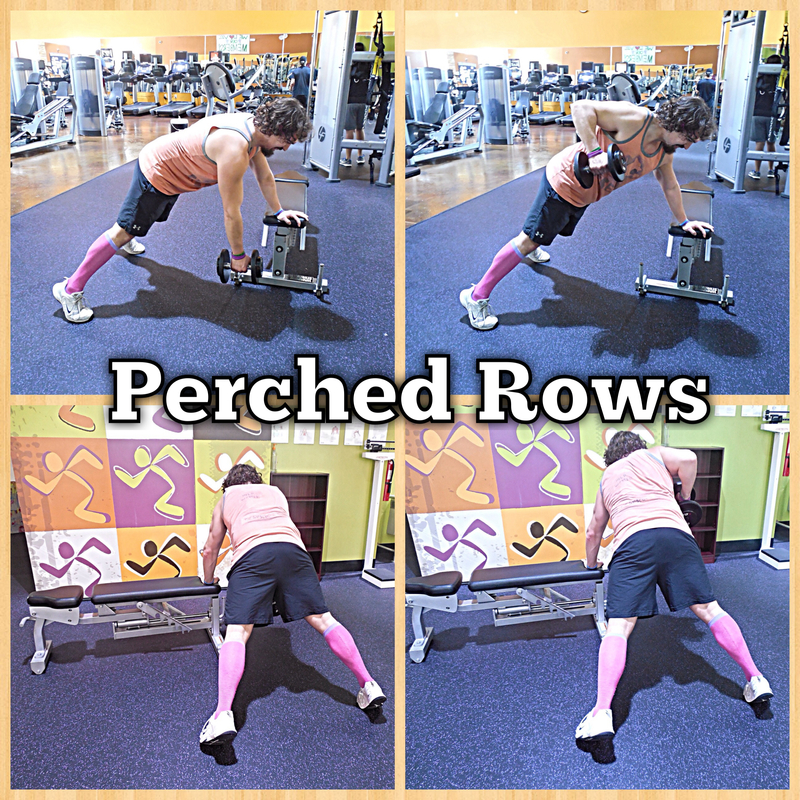 Perched Dumbbell Rows – Select a dumbbell weight of your choice and grab a bench, high step, or plyo box so you position your body in a wide stance push-up position with one arm on the bench and the other arm hanging straight down towards the floor. Maintaining the plank position you want to pull the dumbbell up in a “row” movement before stretching it all the way back down. Do all your reps on the side of your choice before repeating on the other side! 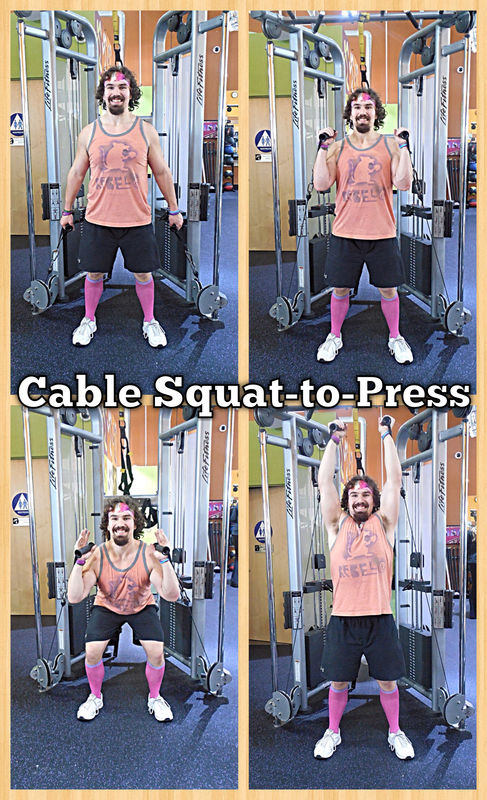 Cable Squat-to-Press – Utilizing the center cable machine in the center of the free weight area you want to make sure both cable attachments have the short grips on them and they are all the way to the ground. Select the weight that works for you before grabbing the handles, curling them up to your shoulders (and keeping them there), squatting, and then pressing on the upward end of the squat. 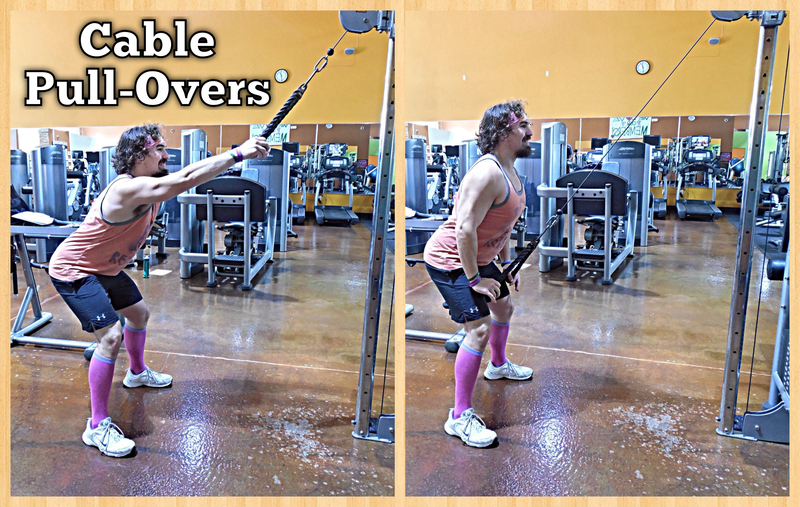 Lower the handles while you go back to the squat and repeat! 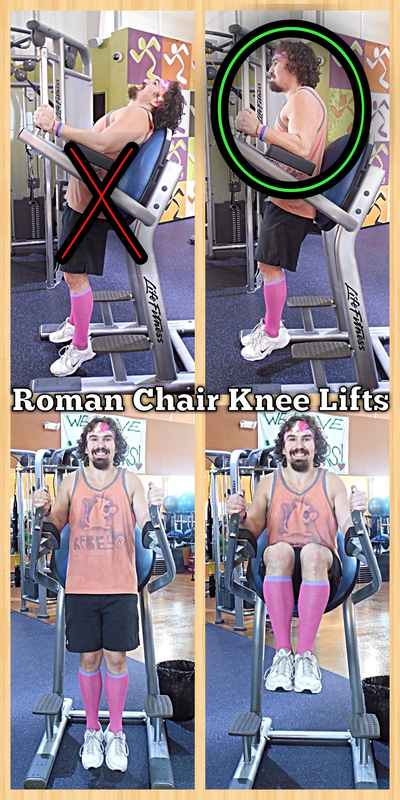 Roman Chair Knee Lifts – First off when position yourself in the roman chair you want to make sure that you are NOT leaning all the way back on it but rather keeping your shoulder over your elbow for maximum efficiency and functionality. Remember you have platforms you can place your feet on for a break if you start to slip. Once in proper position simple go from having your legs hanging straight down to bringing your knees up as high to your chest as you are able and then… Repeat! 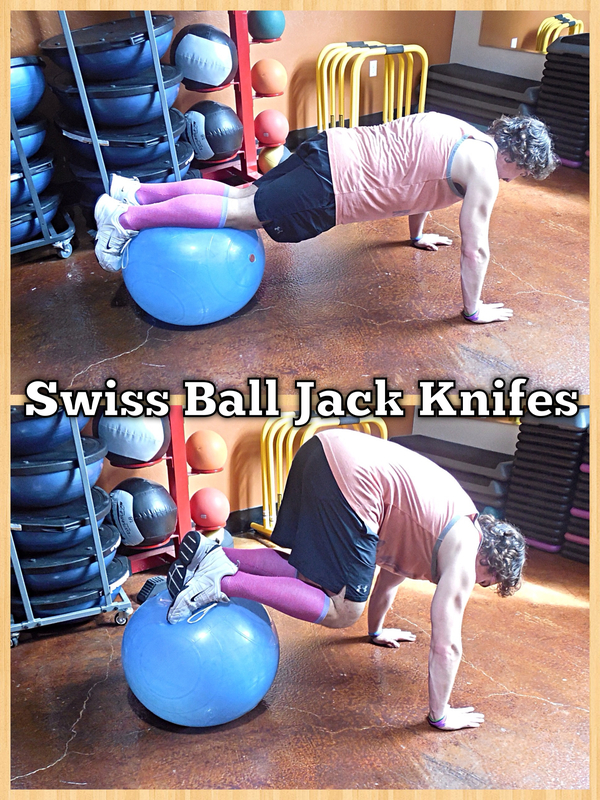 Swiss Ball Jack Knifes – For this exercise you want to get into a plank position with your legs on a stability ball and arms straight. From here you want to drive your knees forward while doing your best to raise your hips towards the ceiling in the process. If your body doesn’t agree with this movement do your best to hold a plank with your legs on the ball and maintain it with no movement.